Super Bowl hero Malcolm Butler covering All-Pro receiver Antonio Brown should be one of Sunday's best matchups. We have about seven hours of football left until we know which two teams will head to Houston and battle it out for Super Bowl 51. Based on how the regular season went, we got the two teams you probably expected to see out of the AFC (you could make a case for Oakland, I guess, but Derek Carr's injury took care of that), and while we didn't get the teams you would expect from the NFC, we did get the No. 2 seed in the conference and the team that beat the No. 1 seed, so you can't say the teams are undeserving. Most fittingly, though, is the quarterbacks who we have left. We have the two who finished as the best quarterbacks in the league by virtually any metric under the sun (Ryan and Brady), a quarterback on a nine-game winning streak with a QB rating in the ballpark of 120 (Rodgers), and a quarterback with two Super Bowl rings who has all the potential in the world to throw for 500 yards and 5 touchdowns on any given Sunday (Roethlisberger). And think of the potential Super Bowl matchups. Patriots-Packers. Patriots-Falcons. Falcons-Steelers. Packers-Steelers. Not one potential dud. That wouldn't have been the case if the Chiefs or Giants had advanced this far. Let's all consider ourselves lucky. With this past weekend's games, Jeremy pulled into a two-game lead for the postseason. Both Jeremy and Joe had a successful Saturday, even after sweating out a close first half between New England and Houston before the Patriots rallied to cover an enormous 16-point spread. Jeremy had both Green Bay and Pittsburgh in the hole on Sunday (and would also like to point out that he nailed the Green Bay-Dallas score to the exact point and was generally right about everything) while Joe put his faith (erroneously) in Dallas and Kansas City. With those results, Jeremy moves to 7-1 for the postseason, Joe sits at 5-3. There are a ton of matchups, trends, and storylines to consider in each of these games, so let's not waste any more time. Here's what we know: Jordy Nelson is probably going to be out, but Davante Adams and Randall Cobb will step into those shoes nicely. Green Bay's offense is organized in such a way that their receivers occupy several different roles and line up in several different spots within the same game, often even on the same drive. So it's not like there's a void in a specific role, there's just less talent on the field when he isn't out there. We know that Aaron Rodgers (a) is the hottest quarterback in the league and (b) may or may not actually be human. He darts in and out of the pocket, buying enough time for someone to get open, and then fires a rocket with pinpoint accuracy. It's insane. I don't know how he does it. Here's what else we know: Atlanta struggled a great deal to defend the middle of the field against against the pass. They ranked 29th in the league defending "other" wide receivers (i.e. not a team's No. 1 or No. 2 receiver), and 26th against running backs, per Football Outsiders. Since Desmond Trufant went on I-R, their depth at cornerback has been a problem, and starting two rookies at linebacker and another at safety leads to a lot of gaps in coverage. Cook, Rodgers, and Allison are the wild cards in this matchup. You should expect Adams and Cobb to be about as productive as they always are. Cook, Rodgers, and Allison are the guys who will occupy the middle of the field (for the most part) and attack the seams. The three combined for 10 catches, 174 yards and two scores against Dallas (plus the game-swinging catch on the game's final drive to set up Mason Crosby's winning field goal). The middle of the field is going to be open, and it's up to these guys to take advantage of it. As much as it might not seem like it, Rodgers and Ryan aren't perfect quarterbacks. Sure, Rodgers is on the outrageous tear that you've heard about ad nauseam over the last month, and Ryan led the league in pretty much every efficiency-related quarterback statistic (and is on a Rodgers-level tear over his last five games - 293 yards per, 14-0 TD-INT ratio, and a QB rating north of 130), but these two guys do make mistakes. Matt Ryan, meanwhile, has a hit-or-miss history in the playoffs. He was absolutely dreadful in his first three playoff starts before having a pretty good 2012 postseason, his last January appearance before this year. Obviously, it's a small sample size, and he's done plenty this season to prove that he's a top-flight quarterback, but prior to this year, Ryan had established himself as a decidedly above-average but decidedly *not* exceptional quarterback. His passer rating this season was almost 20 points higher than his previous career-best (a 99.1 mark in 2012, the last time the Falcons were in the playoffs). Would it shock anyone if Ryan had just an average game and couldn't keep pace with Rodgers? Yes, both of these quarterbacks are excellent, and yes, both of these defenses leave a lot to be desired, so it's certainly possible that both throw for 350 yards and four touchdowns and both teams score in the 40s. But it's more likely that one of these quarterbacks makes a big mistake at the wrong time and it ends up swinging the game. Which one is it? That's anybody's guess. But for my money, it's probably going to happen. The Falcons list Beasley as a linebacker, but he's most out home lining up in the wide-9 technique and blowing by unsuspecting right tackles to get to the quarterback. Beasley used his blazing speed to lead the league in both sacks (15.5) and forced fumbles (6), but he did most of his work off the right side, working against the tackle that is usually bigger, and a bit slower. Bulaga is neither of those things. In fact, he might be the best pass protecting right tackle in the league, and one of the best overall pass protectors in football. It's actually Bulaga's run blocking that needs some work, but in this offense his game is perfect. Not much to this matchup: Can Bulaga contain Beasley's speed, or will Beasley force that dreaded "quick pressure" on Rodgers? Obviously, the Falcons are very young, and very thin in their back-7, but rookie Keanu Neal out of Florida has been a definitive bright spot. Neal will need to do many things Sunday for Atlanta to have a chance, but two of the biggest ones will involve him going toe-to-toe with Green Bay's hero from last week; tight end Jared Cook. Firstly, since Atlanta's young corners will likely be getting help from safety Ricardo Allen on the outside, Neal will need to shut down Cook over the middle, taking away inside verticals and option routes. But, and perhaps even more importantly, Neal will need to get free of blocking to shut down Green Bay's effective screen game. Since Neal will line up at both linebacker and safety, the guy blocking him will likely be Cook for much of the afternoon, and he'll have to disengage from the tight end and deliver some of his big hits if Atlanta is to get off the field. Green Bay was quietly pretty good rushing the passer, finishing 6th in the league with 40 sacks, led by defensive end Nick Perry's 11. However, the Packers made much of their hay using quick stunts, blitzes and twists to the interior of the line, including looping Perry and Julius Peppers around, crashing tackle Mike Daniels hard toward the A-gap, and generally creating chaos for opposing interior lines. The Falcons are built to counter that, sort of. Center Alex Mack has been sensational this year, and has done a great job identifying and neutralizing stunts against the run and the pass, and left guard Andy Levitre is having a fine season as well. Right guard Chris Chester… Not so much. The first time these two teams met, Green Bay sacked Matt Ryan twice, but otherwise weren't able to generate much pressure. The one spot they did get consistent pressure, though, was with Daniels working on Chester. The Falcons will be cognizant of that, and may have Mack open up right to help in case Daniels wins inside, but that could leave Atlanta susceptible to a stunt coming from the left end. The trenches could end up being a chess match in this one. Ladarius who? Yeah, I know, under normal circumstances this would be a laugher of a matchup, but with Julio Jones playing on a bad foot, and Gunter seemingly the only guy in Green Bay's secondary with a pulse, here we are. The Packers will likely use a bunch of different guys and coverages on Jones, since Gunter got cooked by Dez Bryant last week when they were singled up, but when the next best options are Damarious Randall and Quinten Rollins, you can be sure he's gonna see a ton of action. Really, this matchup is just about Jones who, if healthy, should have a monster game. Only injuries have slowed the All-Pro receiver all year, and it seems like a nagging one sprung up a few weeks ago at the worst possible time. Picking Green Bay paid off last week, and saying the score would be 34-31 turned out to be prescient as well. These teams are rather similar. Two elite offenses, led by two all-world quarterbacks, with great depth at wide receiver, some wildly underrated running backs, and great offensive lines. The defenses are average at best, which means this game is going to feature some scoring. The Falcons are better at the skill positions, but the Packers are better at quarterback, offensive line, and on defense. Do the Packers have a jarring weakness when teams throw deep down the offense's right sideline? Yes. Do the Falcons have a potential counter to Rodgers' scrambling in Vic Beasley? Sure. But Green Bay's offense matches up well against Atlanta's defense, especially in the middle of the field (outlined above), and Atlanta's offensive line struggled at times to keep Ryan upright (Ryan was sacked on 6.4% of his dropbacks, 9th-most in the league). Green Bay was tied for 6th in the league in sacks, led by Nick Perry with 11. All else being equal, if you were to bet on one of these teams to cause problems for the other with its pass rush, the smarter money would be on Green Bay putting Matt Ryan on his backside a few times. The other point worth mentioning is that this game will be indoors. You would think that provides a distinct advantage for Atlanta, considering they're the home team. But if you look at Aaron Rodgers' career splits, he's put up absolutely insane numbers when he plays inside, which become even more insane when you consider that all of his indoor games are road games, where the communication advantage at the line of scrimmage swings the other way. In 22 career games indoors, Rodgers has a TD-INT ratio of 48-10, with a passer rating of 111.1, numbers better than any of his peers. If you remember, Rodgers torched the Falcons, in Atlanta, to the tune of 366 yards, 3 touchdowns (plus another by foot), and a passer rating of 136 on Green Bay's path to the Super Bowl in January 2011. Obviously, this Atlanta team is totally different, with different personnel and a different coach. I'm not saying this to suggest that if he beat that Atlanta team, he can beat this one. I'm saying it merely to suggest that Rodgers goes to another level in a dome. If Rodgers has a Dome Game, this is Green Bay's game to lose. Since I need to catch up with you in the pick department, and Jordy Nelson won't be 100 percent, I guess I'll take Atlanta, but this seems like a coin flip game to me. Rodgers is playing out of his mind, but Atlanta seems like the one team that will be able to find some balance in this game, and if they can run the football as well as throw it, that should take a little wind out of Green Bay's pass rush sails. Sustained Atlanta drives mean more time on the sideline for Aaron Rodgers, and let's not sell this underrated Atlanta defense short. If they can keep Rodgers in the pocket and avoid stupid penalties (two things that killed the Cowboys last week), they should be able to force at least one turnover, and get a pair of stops. In what figures to be a shootout, that could be a enough. Either way, this game should be a ton of fun. Dion Lewis played the first seven games of 2015 before getting injured. In those seven games, he amassed 622 yards from scrimmage on 85 touches, scoring four touchdowns in the process. He's played in eight games since his return from ACL surgery in 2016 (seven regular season games, plus this past weekend's game), and in those eight games, he has gained 441 yards from scrimmage on 96 touches, with three total touchdowns (all coming Saturday night, including a 98-yard kickoff return touchdown). Those numbers don't exactly leap off the page. Sure, it's nice to have a running back who has gained over 1000 scrimmage yards over roughly one season's worth of games at a clip of almost six yards per touch, but compared to say, Le'Veon Bell (2224 yards, 11 touchdowns, 5.5 yards per touch in 14 games this season), it's barely noteworthy. Here's what is noteworthy: In the 15 games that Dion Lewis has suited up, the Patriots are 15-0. Granted, the Patriots are 13-7 when Lewis doesn't play over the last two years (including playoffs), which is nothing to sneeze at, but there's obviously a large gap between 13-7 (about as good as the 2016 Giants) and 15-0 (about as good as the 2007 Patriots). It seems strange that Lewis would represent such a game-changing presence for the Patriots, but it's really the combination of him along with James White that gives New England an element of their offense that other teams just don't have. Between White (108 receptions, 1064 yards, 10 TDs since the start of 2015) and Lewis (55 receptions, 505 yards, 3 TDs over the same span), the Patriots always have a dynamite receiving back on the field. The Steelers have Le'Veon Bell, who presents a nightmare matchup in the passing game, but New England's two running backs equate to roughly the same production, except they do it without having to play every down - New England's backs stay fresh. When you add LeGarrette Blount (1864 rushing yards, 24 TDs) into the mix, all of a sudden you're looking at the most diverse and flexible set of running backs in the league (outside of maybe Atlanta). It gets at the question of what you want to have when you build a roster. Would you rather have three backs (who each make peanuts, effectively) combining into a three-headed monster of absurd production and spread the rest of your money around elsewhere, or would you rather have one jack-of-all-trades running back (who makes considerably more money) who can do it all himself and suddenly you have two roster spots to add depth to other key positions? The Patriots obviously value a diversified roster with a lot of specialization, hence the famous Belichick mantra of "Do Your Job." Between Lewis and White, the Patriots keep the pressure on opposing defenses with the threat of a check-down becoming a legitimate plus-value option. If one or both of those guys are clicking, there may just be too much for the Steelers' defense to cover. One of the key deciding factors in this game will be which defense tackles better. Does that sound stupid? Of course it does. The whole point of a defense in the great sport of football is to tackle the fellow who carries the ball, so obviously if a defense can't tackle the fellow with the ball, it's going to be a long day for them. The point here, though, is that both of these offenses are largely built around their ability to break tackles and gain yards after contact. Both teams have running backs who have built their careers on either running people over (Blount) or being so damn patient in the backfield that sometimes they aren't even touched until they're five yards downfield (Bell). Both teams have backs that are deadly receivers out of the backfield, both on check-downs in the flat and when they split out wide as extra wide receivers (Bell, Lewis, White). Both teams have small, shifty receivers who make a living on crossing routes and churning up yardage after the catch (too many to name). Pittsburgh is much better at attacking defenses deep down the field, but the Patriots have actually been pretty good at defending deep passes, and overall have one of the more talented secondaries in the league (and certainly have the most talented secondary remaining in the postseason). Generally speaking, the Patriots don't let teams beat them deep in the playoffs, at least not the guy that you'd expect to beat them deep. You can be sure that they will spend most of Sunday evening rotating their coverage in the direction of Antonio Brown, making sure he doesn't take the top off the defense. What's left will be the underneath game. Making one man miss and scampering for a first down will be huge in this game. It's more likely that these teams will grind out long drives than gain yardage in big chunks; this matchup lends itself more to efficiency than explosiveness. The team with more broken tackles by the end of the game is probably the team that's going to find itself on a plane to Houston. 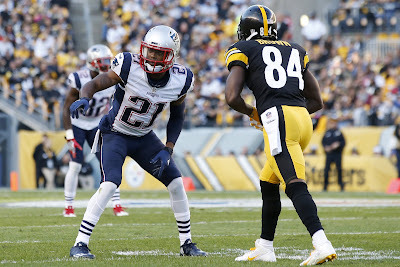 This should at least be the most entertaining matchup of the evening, as All-Pro receiver Antonio Brown attempts to shake Super Bowl hero Malcolm Butler. Though most know Butler for his game-saving Super Bowl interception against the Seahawks two years ago, he has actually grown into one of the better cover corners in the league the last couple of seasons. The first time these two squared off, Butler started brilliantly, picking off a pass intended for Brown in the end zone. Now, the starting quarterback for Pittsburgh that day was backup Landry Jones, but still, Butler ran step-for-step with Brown early, before giving way to 7 catches for 107 yards by Brown. It was a back-and-forth affair, just like this one should be, but look for the Patriots to help Butler out with (somehow still) underrated safety Devin McCourty keeping an extra eye on Brown. Keeping Tom Brady upright and knocking back the Steelers edge will be critical for New England's pair of offensive tackles, who have well out-performed expectations this season, especially Cannon. A liability last year, Cannon has turned into the team's best run blocker, and a reliable pass protector on the right side, while Solder has solidified himself as one of the 10 best tackles in football. Trying to get through and around them will be a pair of outside linebackers that few predicted would figure too heavily into Pittsburgh's season. The first is 38-year old James Harrison, who began the year as a backup, but entered the starting lineup for the back half of the season. Joining Harrison was Dupree, a second-year player and former first round pick who spent the the first 10 weeks of the season on injured reserve. Since the two joined forces, Pittsburgh's once toothless pass rush has had plenty of bite, with Harrison collecting 7.5 sacks (including the postseason), and Dupree five. At this point, Harrison is the better run defender, and better at chipping tight ends and covering backs, but the Steelers like to use him against an opponent's left tackle (Eric Fisher, anyone? ), which means the quicker, younger Dupree will be going against Cannon most of the evening. That should be an advantage for the Steelers in the passing game, but a huge plus for New England when the Patriots choose to run the ball. On the other side, does Harrison have another great game left in the tank? The outside of the line of scrimmage should be a heck of a battle. The Steelers were able to get under Travis Kelce's skin last week, and limit him to just a few big plays, and the Pittsburgh D will have to deal with another big tight end that can run this week in the form of Martellus Bennett. The always colorful Bennett was largely a non-factor against the Texans last week (probably because New England's receivers and backs were getting open so easily), but teams have tried to hit the Steelers down the seam all year, and Brady has done it many times recently with Rob Gronkowkski. Bennett ain't, Gronk, but he ain't bad either. Part of the reason teams feel they can beat the Steelers down the seam is the occasionally undisciplined play of veteran safety Mike Mitchell, and the inexperience of rookie safety Sean Davis. To compensate for that, the Steelers have been letting veteran inside linebacker Lawrence Timmons carry the seam inside a bit more, hoping to take the route away quickly and give the safeties time to recognize it. That strategy worked, with only one major hiccup last week, and it will be interesting to see how else Pittsburgh tries to slow down Bennett. Also, how many resources they devote to him, given that New England's receivers are playing so well? Last week the Steelers had James Harrison bullying Kelce at the line, and would even throw slot corner William Gay on him occasionally. Pittsburgh will likely need those two guys for other things against a more diverse Patriots offense, so Timmons may end up on his own down the seam with Bennett. Pouncey may have played his best game of the season last week in Kansas City. Though some odd play calling and silly mistakes kept the Steelers out of the end zone, Pittsburgh did still rush for 171 yards on over 5 yards per carry, and controlled the clock, possessing the ball for over 34 minutes. The oft-injured, occasionally dominant center was a huge part of that. When the Chiefs lined nose tackle Dontari Poe in front of Pouncey, he handled the big fella, and when they shifted their line to the strong side, leaving Pouncey uncovered, he helped one of his guards with a double-team, then got to the second level to wreak havoc on linebackers. Unlike the Chiefs, who use three, and sometimes only two man lines, the Patriots will show Pittsburgh a ton of four-man fronts, and Bill Belichick's lines always have some interesting stunts and twists up their sleeve. If Pouncey is able to identify what New England's defensive line and linebackers are trying to do, he will then have to deal with the size and power of Alan Branch and Malcom Brown the same way he dispatched of Poe. Pouncey has his work cut out for him, but if any center has the strength and blocking ability in space to do the job, it's him. It has been reported that over 15 Steelers are battling a stomach flu. That is obviously less than ideal. For some reason, my money is on this game being one that features a lot of awkward scores. Probably a half-dozen field goals between the two teams, a few two-point conversions, maybe a safety. A straightforward 28-21 score just doesn't seem likely for two teams that have played so many wacky games over the last decade. I'm rolling with New England for a few reasons. First of all, they have the better coach and the better quarterback. That isn't really in dispute. They have home-field advantage, and are near-unbeatable at home in the playoffs under Belichick (16-3, 8-1 since 2010). They've been the best team in the league all season, and Pittsburgh hasn't really done much so far in these playoffs to suggest that an upset is brewing (if they had torched Kansas City by two touchdowns, that might be a different story). We've spent a good amount of time talking about the offenses of these two teams, and for good reason - both of these offenses are really, really good. But both of them have great defenses as well. As the season has gone on, the both units has gotten better and better, culminating in long winning streaks, both of which are ongoing. New England has won eight straight, and allowed just 12.9 points per game and just 282 yards of total offense over that span. Pittsburgh has won nine straight, and if you exclude their Week 17 game against Cleveland (when they rested starters everywhere), the Steelers have surrendered just 15.6 points and just 268 yards per game. And both teams have been forcing turnovers as well (17 in the last eight games for New England, 18 in the last nine for Pittsburgh). However, it comes back to coaching. If you had to bet your life on one of these coaches to come up with a scheme to effectively attack the other team, you'd bet on Belichick. If you had to be your life on one of these defenses stepping up to flummox the other team's offense, you'd bet on a Belichick-led New England defense, at home. Don't get me wrong - these teams are more even than they seem at first glance, and the six-point spread might be a point or two higher than it should be, but the safer bet is on New England. Also, I'm a huge homer. I'm a Steelers fan, and I've seen this all before. Of course I'll go into game day hopeful and all that, but I can't forget that Brady and Belichick have torched far better Steelers defenses than this one (though this D has been a pleasant surprise down the stretch), or that Ben Roethlisberger has essentially played two good quarters of football in his last three games (4th Q vs BAL, 1st Q vs MIA). I think Pittsburgh will probably be able to run the ball early, but eventually the Patriots are going to find a way to slow down Le'Veon Bell and this underrated offensive line. Heck, even the Chiefs did late last week, and Roethlisberger only had to make a few good throws to salt away a game that Pittsburgh dominated in every other phase. Since I doubt Pittsburgh will dominate every other phase this week, that means Roethlisberger will have to be great, and he just hasn't been for over a month. For that reason, and for the obligatory reverse-jinx, I have to take the stupid Patriots.